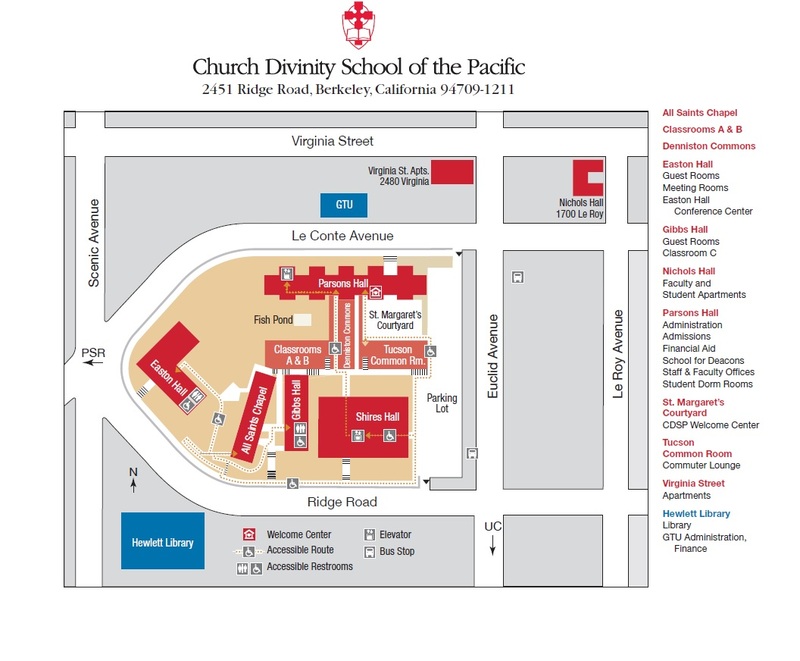 Use this form to alert the CDSP Welcome Center of your access needs prior to your visit to the Church Divinity School of the Pacific campus. Which guests should use this form? Use this form if you are a guest planning a visit to CDSP campus. Easton Hall hotel guests receive a similar form with their booking confirmation. CDSP students are encouraged to contact the Dean of Students and use the access needs intake form on the Moodle website. In addition to these forms, CDSP and other GTU students can also contact the GTU for ongoing disabilities and educational accomodations: https://www.gtu.edu/admissions/life-at-gtu/students-with-disabilities. What brings you to CDSP? Indicate if this will be a reoccurring or regular visit. Take a look at the map below. When considering what your accessibility needs might be, please be advised that our campus is located on the very hilly Berkeley Hills. For example, taking the series of steep stairs from the parking lot to Easton Hall is the equivalent of walking up five flights. Where will you be going around campus? Easton Hall All Saints Chapel Gibbs Hall Classrooms A & B Tuscon Common Room Denniston Common St. Margaret's Courtyard Parsons Hall Offices Parsons Hall Dorms I'm not sure. Our Accessibility Volunteer Team consists of student volunteers who help our guests to navigate ADA routes, elevators, and restrooms throughout the CDSP campus. Would you like to be paired with a student volunteer for your visit? Please select the following categories of accommodations that would be helpful to you. Feel free to elaborate or add other requests in the question box below. What other access needs and accommodations would you like to discuss with the Welcome Center?